You have, thanks to a particularly generous offer at the supermarket one day, one whole kilo of the largest, spindliest, most succulent raw tiger prawns in your refrigerator. They are sitting there quietly (okay, they’re dead, so they’d better be quiet! ), awaiting their fate, which really must be decided soon, or else all that sweet succulent prawniness is going to slowly rot away. You know that they probably won’t need more than a flash fry with a little bit of garlic and lemon, but something about the ordinariness of that preparation is still bugging you. You decide to give it a bit more thought and see if something better comes to mind. Later that day, you conveniently find yourself in your neighborhood bookstore, which has a moderately-sized cookbook section. Your steps are taking you naturally in that direction out of normal book-browsing habit, when you realize this might be a perfect place to seek some inspiration for your dinner – just a few ideas, nothing more. You browse your way through a few uninspiring books and then pick up a book you’ve seen there several times before, one you’ve been secretly admiring, a book dripping with beauty and style, but alas, a book that is (for the moment anyway) just a little more than you can afford. However, upon lifting it up and resting it on your forearm to browse, it falls open, as if by magic, to a recipe for Prawns with Lemon, Chili, Garlic & Feta. You stop and stare. Not only does it offer a use for those prawns at home, but the only way you could ask for more of your favorite things together in one pot would be to add chocolate. And speaking of the pot, the recipe (as if reading your mind) calls for some type of large, cast-iron pot for this dish, and what do you happen to have back at home, just waiting to be called into action? You know even before you’ve finished reading the recipe that this is it. Your dinner has found you. But what to do? The recipe has multiple components, it contains involved instructions, and really, you want this dish, not some half-hearted attempt at recreation. Do you buy the book? You can’t afford it. Do you put the book back on the shelf with a sigh of resignation? Of course not. You need that recipe. You will do anything to get that recipe, short of anything overtly illegal. So you glance over your shoulder to make sure no one’s watching, you duck into a quiet corner where no one will bother you, and you spend twenty-five whole minutes memorizing that recipe. You scrutinize every last gram of every last ingredient and you don’t give up until you can recite the entire recipe by heart. Then you stealthily slip the book back on the shelf (no worse for wear, naturally), and run home as fast as your legs will carry you in order to write down what you’ve memorized before the details start to fade. And was it worth it, all the nail-biting and heart-racing and mental fatigue that memorizing that recipe entailed? Wouldn’t it have been easier to just try to improvise something similar? As if you needed to ask. It was more than worth it. It was AMAZING. The prawns were so tender and succulent we barely remembered to peel them before inhaling one after the other. The sauce was so good we drank the last spoonfuls from the pot, and we licked our fingers so clean we didn’t even touch the fingerbowls. So yes, it may sound crazy, but I’m certain that faced with the same kind of dinner dilemma you’d have done exactly the same as me. If you want, prepare the prawns by cutting the shells open along the spine and removing the intestinal tract. I didn’t bother. Spread about 1/4 of the butter in the bottom of a large heavy cast iron or enameled iron pot. Put 1/3 of the prawns on top, and sprinkle with 1/3 of the garlic, a little salt, and some of the chili powder. Cut in more butter on top. Repeat with two more layers, using half the remaining ingredients for each layer. Cover the pot, place on a large burner and turn it on to high heat. Cook, shaking the pot from time to time, for 8-10 minutes, or until the prawns have all turned pink and the garlic is smelling very fragrant (I found it took less time). Remove from the heat and uncover. Crumble in the feta, sprinkle in the parsley or cilantro and squeeze in the juice from the lemons. Cover again, return to the heat and cook for another ten minutes, shaking from time to time, until the feta starts to melt into the sauce. Hi Melissa – I don’t remember this recipe in the book, I have to go through again! It must be delicious, I’ve been missing seafood lots since I came to the UK (as you can guess)… Stunning shot, as always! I had prawns for dinner on the weekend! *grin*This recipe looks fab!!! Oh… sounds so good! I’m still making do with berries and raw food. (Think broad beans right out of the pod.) Have a wonderful trip back to the greens and blues of the PNW. I’ll be looking forward to your posts from a little closer to home. Melissa,”you spend twenty-five whole minutes memorizing that recipe”Clearly you wasted your youth doing things that preserved your mental capacity — and damaged your sanity.I, on the other hand, am completely sane but can’t remember squat.And the prawn recipe looks seriously good!. Gorgeous photo, gorgeous pot, gorgeous post. Could it get any better? Well, I guess it could – I could be eating those lovely prawns right now! I love the pairing of the feta and prawns, somehow the tang of the cheese seems a perfect briney-coutnerpoint to their succulent sweetnes. Dear MelissaWe recently bought the book, but I never expected to actually use it in the kitchen (we chose it more for layout, design, inspiration). I lugged her first book back from Adelaide years ago but never went beyond admiring the gorgeous images. Your post, however, has convinced me to give her recipes a go.Thank you. Hi Melissa – I really, really, really don’t like prawns, but I love the Falling Cloudberries book (though I thought it could have at least have a picture of cloudberries on the cover – it’s such a delicious and unusual berry). And despite being slightly scared of those creatures on your pic, I must admit the image is visually beautiful! Hi Keiko – I’m not surprised you’re missing seafood! I’ve always been dismayed at how small a role seafood plays in the British diet, despite the coastline everywhere. Tessa has several good-looking fish & seafood recipes in this book, if I recall correctly – you should be able to find something inspiring…Hi Ce – Good tip on the mobile phone, I didn’t even think of that! I guess it would just look like you were sending a text message. Will try next time!Hi Catherine and Clare – Are prawns in season or something? Maybe it’s just in the air… ;)Hi Paz – It’s amazing the things we don’t even know we’re capable of until a good meal is at stake! By the way, if this book looks good, you should also check out her other beautiful book called ‘Twelve’ – that one I actually have and can heartily recommend!Hi Heather – Broad beans, yum! I’ve just arrived back home and I can’t wait to get to the markets… So many summery things here I’ve been missing! Hi Reid – I also love them spicy, so when I halved this recipe I didn’t halve the chili. Prawns are so easy and good – I say go for it!Hi Kevin – Guilty as charged 😉 Actually, though I knew the sanity was long gone, I was pleasantly surprised to find some mental capacity still intact. And yes, ‘seriously good’ is a pretty accurate description :)Hi Tara – That’s exactly what I thought when I spotted the recipe. Although I love any kind of cheese with seafood (is that the sound of millions of Italians turning over in their graves?) feta is particularly good. By the way, I’m crossing my fingers that you solve your technical problems soon… I’ve been missing your posts!Hi S – I also have her first book and admit to never having made anything from it. They are works of art, though, aren’t they? After the success of this recipe I’m planning to stop admiring and actually try some of the recipes from Twelve.Hi Fanny – Pictures with your mobile, I love it! I also am suffering from cookbook-buying overdose lately, so I’ve forced myself to wait a while before buying this one… *sigh*Hi Pille – I had cloudberries once when I was in Sweden. They were really good, but kind of seedy, arent’ they? And yes, those prawns were kind of scary! For some reason I find them more scary before they’re cooked than after, even though they look basically the same. Maybe I’m afraid they’ll just suddenly come back to life and start waving around their little tentacles… Anyhow I’m sorry to hear you don’t like prawns – do you like other kinds of seafood? That really is a stunning photo Melissa. I don’t even eat meat and my mouth is watering! Hi Melissa, yep, cloudberries have tiny seeds in them, but they’re equisite and I don’t mind the seeds at all. Some people prefer sieving the cloudberry jam, but I like them just the way they are. I have lovely memories picking them in bogs with my granny.. And re: prawns – I happily eat most fish, but all crustaceans and molluscs and creepy-crawlies with tentacles, shells or whatnot spook me. Totally. Melissa,Amazing, as usual. I would NEVER think to pair prawns with feta, but this sounds delicious.Have a great vacation! Paz – cloudberries are native to northern countries, like Scandinavia, Baltic countries, northern Russia, and grow mainly in bogs and marshes. They’re not very easy to pick, as you only get one-two berries from each wild plant. That’s why the cloudberry jam in IKEA is so much more expensive than blueberry or strawberry one:) The Finns do a very nice cloudberry liqueur by the way. Melissa, I am impressed with your determination to memorize the recipe, I know you have been oogling that book for some time now! Although someone commented above about using their mobile phone to capture an image of a recipe, that could be a good tip for you :)The recipe looks lovely and of course the fact that you drank up every last bit of sauce is a great recommendation! Just realised that Moira @ Who Wants Seconds has been praising Tessa’s book in her January 2005 entries, too. Oh well, I guess 30% off at Amazon is not bad and I should get the book despite the lack of cloudberries on the cover..
Hi Michele – I think the mobile phone idea was too obvious for me 😉 Actually I hardly ever use the camera on my phone because (apart from the horrendous quality) I haven’t figured out how to download pictures from my phone to my computer. Maybe I need to consult a more tech-savvy person on this…Hi Pille – Do you have Twelve? It’s also a really great book. I swore I wouldn’t buy Falling Cloudberries until I had started to cook from Twelve, however, so it might be a while for me. If you do buy it, let me know which recipes you like! Nope, I don’t have Twelve. And I still don’t have Falling Cloudberries, though I spent 15 minutes drooling over it in Waterstones today.. Beautiful. By the way – I prefer your picture of the chilli feta prawn dish to the original one. But I still absolutely do not like prawns..
Hi Elyse – I certainly wouldn’t let the lack of an iron pot stop me from making this 🙂 Just use a largish pot with a lid (the heaviest you have) and get your burner on full power – everything should be fine! Where I live, I can not find shrimp in their shells. How do you think the recipe would would with regular, shelled shrimp? Hi Wendy – If I were going to make this with pre-shelled shrimp, I would do a couple of things differently (mainly to avoid over-cooking and toughening them). I would use a wide, heavy skillet, and I would start by sauteeing the garlic and chili in the butter over high heat just long enough for the garlic to start to get fragrant. 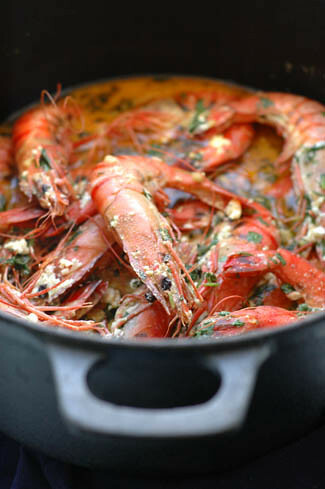 Then I would add the shelled shrimp, the feta and the parsley and toss it around in the garlic butter. While that was sauteeing I would squeeze in the lemon juice and add salt to taste. As soon as the shrimp were all pink and the feta was starting to melt into the sauce, I would take it off the heat and serve immediately. I’m sure it will be just as delicious! (Oh, and I would probably use a little over a pound of shrimp meat to approximate the two pounds of shell-on shrimp.) Good luck! Great improv with feta ! The most I did was with curry leaves, tumeric spices w/freshwater shrimps. hi, I am a blogger and a cook too…I tried this recipe and found it really great, a different taste for prawns!maybe next time I am going to make it more mediterranean using olive oil from Tuscany instead of butter, maybe it will be less creamy, but more healty and lighter…I’ll tell you!I put your link in my new recipes blog:http://buonocomeilpane.blogspot.com/I'll be glad if you come and visit me. THIS recipe is sooooo GOOd i love Tessa Kiros, in fact im cooking this dish in just a few moments. This is actually really delicious with baked sweet potatoes the spicy sauce goes soooo well with the sweetness of the potato.